As I watched the Steelers/Titans game I came up with a good idea for my blog here on Camelclutchblog.com. I will challenge all of you reader in a NFL Pick Em’ game every single week! I will give you my picks here in the blog and then I challenge all of you to send me your picks by sending me an e-mail at [email protected]. Now I don’t have prizes to give you on this blog at least. If you think you are so good at picking NFL games on a week to week basis I then have an opportunity for you to win prizes. Every Thursday Night during our live broadcast at www.blogtalkradio.com/thewheelhoue you will have the chance to win a “prize pack” (some of which will include stuff from our good friends at EA SPORTS!). All you have to do is beat our weekly NFL Pick Em’ guru…Copernicus! You beat him that week you get a prize pack from us! For more info visit our official website at http://wheelhouseradio.wordpress.com. I think the Falcons have the ability to be this year’s Arizona Cardinals and win the NFC Championship. The weapons on offense are amazing and Matt Ryan has the opportunity to have a breakout season and become a household name. It helps when you have Michael Turner, Roddy White and Tony Gonzalez lining up with you on every down. Despite losing this one Miami should have a solid season in the AFC and potentially make a Wild Card spot. This won’t even be close. I am not a fan of Matt Cassell in Kansas City and don’t feel he will live up to the hype he built in New England last season. You got to remember he was playing under one of the best NFL Coaches ever and now he is playing for a first year head coach. Remember that the last time Cassell started prior to last season for New England was in High School. 11 wins later and we soon forget by giving him way too much money. Joe Flacco should have a good season but not one like his draft counter part Matt Ryan. The countdown clock is on for the return of Michael Vick where the Eagles go from NFC Wild Card material to potentially playing in another NFC Championship. This offense is looking good and is ready to click on all cylinders come Week 3 when #7 enters the Wildcat offense. Until then Philly needs to win these two games and make a statement that they can win without the former #1 pick. Carolina wont let Philly walk all over them though, John Fox is a great coach and ready to bring Carolina back into the NFC Championship form not to many years ago. Carolina should be a surprise team this season if that. To many that is an upset pick but I like Cleveland this season. Brady Quinn has been named starter by Eric Mangini and is ready to prove something for the dog pound. In the three seasons Mangini coached the Jets, two of them were successful seasons. His time was cut short because of the quarterback for Minnesota now in Brett Favre. Quinn has weapons with Braylon Edwards needing to prove himself and running game that might surprise everyone. I like Cleveland in this on and a potential 9 or 10 win season. This is a “push” game and was very hard to decide a winner but I went with the Jets in this one because Rex Ryan will have that team fired up. Mark Sanchez is a potential Matt Ryan rookie season waiting to happen and can make Jericho Crotchey a top receiver in the NFL. Houston will have a good season but it won’t be till later in the season as they make a run at a Wild Card spot. I was tempted to pick Detroit in this one but I can’t find myself in doing so after the “awesome” season that had last year. They will win this season, the most 5 games but it won’t be against New Orleans. Pierre Thomas is out but Reggie Bush needs to prove why he was the #2 overall pick a couple drafts ago or he will head into “bust world.” Bush had a strong season last year before he got hurt and we all know how well Drew Brees threw last season. Jacksonville does not impress me this year and it should be the last season Jack Del Rio is on the sidelines in the south, which is sad because he is a great coach. David Garrard really has panned out ever since taking the job from Bryan Leftwich and I’m not on the MJD bandwagon either when it comes to Fantasy Football. Peyton is ready to take Indy back to the top of mountain this season with a first year coach and no Marvin Harrison. He will struggle in the beginning but Reggie Wayne & Anthony Gonzalez should carry him soon enough. Never has there been a time when a Head Coach and Quarterback were both on the hot seat at the same time. Jerry Jones is the George Steinbrenner of football and has given both Wade Phillips and Tony Romo a ton of rope. They took T.O. out of Dallas and Tony dumped Jessica to keep the distractions away for the most part. Jason Witten will have a big year in the Big D this season and is the top fantasy Tight End in my opinion. Tampa does not have the type of team it used to and has a huge question mark at the starting quarterback position with former Pittsburgh back up and former Marshall QB Bryon Leftwich taking snaps now. Combine that with another first year coach and it probably will be a long season in Tampa with rookie Josh Freeman eventually taking the snaps. This is a game where you could essentially flip a coin. Neither team is all that good on paper and more then likely wont have a good season overall. If anything Denver is more likely to have a surprise season then Cincy. Marvin Lewis is a great coach but needs to go to another franchise because he is not getting support in Cincy. Carson Palmer is on the hot seat and Chad Ocho Cinco is on the seat of a psychologist somewhere. Palmer is a great story after coming back from elbow surgery, Cincy for the win in this one. The Giants went 1-3 after losing Plaxico Burress in November and will have a tough time this season on offense as Eli will look for his never favorite target. The Giants still have one of the best defenses in the NFL despite losing their Defensive Coordinator to the head coaching job in St. Louis. The Giants D will carry this team in this one. This one has upset special written all over it because of past history of the super bowl runner ups but this Arizona team maybe different. If anything they will pull out a close one against the Niners. I do not think Warner will be the starter at the end of the season whether it be from injury or by his playing and I do think that the Niners are a season away from being a top team in the NFC. Mike Singletary is ready to make this team into contenders and has the leadership qualities to do so but it may have to wait to be built until the 2010 season. Its Steve Spagnuolo’s debut as a head coach after guiding one of the best defenses in Football to a Super Bowl Championship in 2007 and is ready to do the same in St. Louis. But it’s also the return of Matt Hasselbeck after having a shortened injury season. He has new weapons in T.J. Housh at Wide Receiver who is ready to prove that he is worth every penny. Give Jim Mora Jr. the win in this one. Aaron Rodgers is ready to show everyone why Ted Thompson and Mike McCarthy put all their eggs in his basket and sent Favre to New York or retirement or was it Minnesota? I forget the timeline. Anyway Rodgers, Ryan Grant and Greg Jennings are ready to make the Packers a top team in the NFC North this season. Jay Cutler is still getting used to the Chicago offense and should be clicking around Week 4 at the most. But Green Bay, in Green Bay on Sunday night, got to go with the Pack in this one. This will be closer then you think as 6 of the 9 defensive starters in New England are no longer there. The one key factor in this matchup is simply Tom Brady. 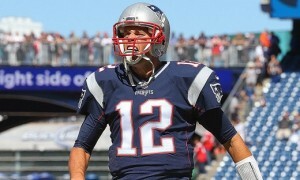 Tom Brady is back and ready to show everyone why he is the Top QB in the game. Remember 2007? Remember his record setting season? Remember 18-1 and that bad taste in his mouth? Well that has sat with him for almost two years now and he’s ready to bring New England back into the AFC Playoffs and Super Bowl contention. I actually like Oakland this season and maybe having an 8-8 year but they won’t do it against San Diego. Rivers, LT and the Chargers defense is just too good. Despite the headlines from the week San Diego should be ready to go against a Oakland team where the coaches are actually fighting one another. Send me your picks and let me know what you think! And if you want to win a PRIZE PACK courtesy of us join us for our LIVE show on Thursday’s by going to www.blogtalkradio.com/thewheelhouse for your chance to win! Check us out and see you inside the Wheelhouse! Grab a Brett Favre Alternate Reebok NFL Replica Minnesota Vikings Jersey now by clicking here. for the best sports analysis online, plus ESPN The Magazine!